Faraway Press: The Online Home of John Jackson Miller: KOTOR #37: Tall, green, and scaly! KOTOR #37: Tall, green, and scaly! 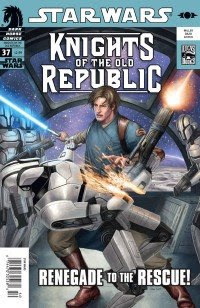 Inaugurating a new thread on this Inauguration Day: Everyone's favorite Trandoshan (he's not much of a pilot, but you should try his Belgian waffles) Slyssk gets a turn in the spotlight in Star Wars: Knights of the Old Republic #37, which makes its debut on shelves this week. I'm not certain whether it's Wednesday or Thursday, given the holiday schedule this week — but I would assume some portion of the world gets it tomorrow. I'll have thoughts on the issue to follow, but leave yours here. I should also have some news on some podcasts coming up in a few days. Lego! Lego my comic books! Knights of the Old Republic #37 on MTV!